Next to the Barcode field, select the Replace Barcode button. This will clear the barcode field. Enter a new barcode and Save the record. The screen will refresh and the new barcode will display in the patron summary pane. If a patron’s barcode is mistakenly replaced, the old barcode may be reinstated. Retrieve the patron record as described in the section Searching Patrons. Open the patron record in edit mode as described in the section Updating Patron Information. Select the See All button next to the Replace Barcode button. This will display the current and past barcodes associated with this account. Check the box(es) for all barcodes that should be “active” for the patron. An “active” barcode may be used for circulation transactions. A patron may have more than one “active” barcode. Only one barcode may be designated “primary.” The “primary” barcode displays in the patron’s summary information in the Library Card field. 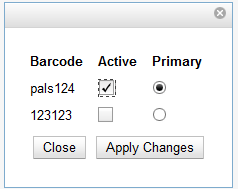 Once you have modified the patron barcode(s), Save the patron record. If you modified the “primary” barcode, the new primary barcode will display in the patron summary screen.